Roman gladiators had a diet that was mostly vegetarian, according to an analysis of bones from a cemetery where the arena fighters were buried. The study has been carried out by academics from the Medical University of Vienna in Austria and the University of Bern in Switzerland. They found the gladiator diet was grain-based and mostly meat-free. The examination of gladiator bones also found evidence they drank a drink made from plant ashes. This ash drink was a form of health-boosting tonic to help gladiators recover after fighting and training. "Plant ashes were evidently consumed to fortify the body after physical exertion and to promote better bone healing," says Fabian Kanz, from the department of forensic medicine at the Medical University of Vienna. He said it was like the way "we take magnesium and calcium, in the form of effervescent tablets, for example, following physical exertion". The conclusions about this ash drink were based on measuring levels of strontium in the gladiators' bones. The bone analysis was based on excavations of the graves of 22 gladiators from about 1,800 years ago in the Roman town of Ephesus, now in Turkey. The bones revealed that the typical food eaten by gladiators was wheat, barley and beans - and this echoed the contemporary term for gladiators as the "barley men". There was little sign of meat or dairy products in the diet of almost all of these professional fighters, who performed in front of Roman audiences. But there were bones from two people that seemed to have a different pattern, revealing a diet much higher in animal protein and lower in beans and pulses. 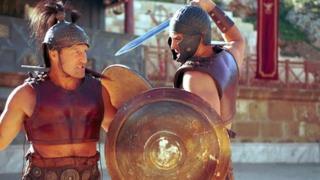 This could show there were gladiators originally from other parts of the Roman empire who had a different type of diet. And the next stage of the research will be to use the analysis of the bones to look for where gladiators might have once lived. The researchers say that gladiators were mainly prisoners of war, slaves and condemned offenders. But there were also people who volunteered to train and take part in contests. They estimate that men taking part in gladiator contests had a one-in-nine chance of being killed, each time they fought.